Habit: Perennial herb, from rhizome or bulb, or rhizomes ending in weakly developed bulbs, scapose or not. Leaf: alternate, whorled, or mostly basal and spirally arranged, deciduous after 1 year or not. Inflorescence: raceme, panicle, or flowers 1. Flower: perianth parts 6, in 2 petal-like whorls or of sepals and petals, free or fused below, +- spreading; stamens 6, from perianth, anthers attached at base or near middle; ovary superior or partly inferior, chambers 3, styles 3, persistent. Fruit: capsule, loculicidal or septicidal. Genera In Family: 10 genera, 130 species: northern hemisphere. Note: W North America Zigadenus moved to Toxicoscordion. Stem: +- scapose. Leaf: +- basal, reduced upward, linear, generally folded, +- curved, entire, deciduous after 1 year. Inflorescence: raceme or panicle; flower bracts 1 (or reportedly 2). Flower: staminate, sterile, or generally bisexual; perianth parts 6, petal-like, free or +- fused to ovary base, white to +- yellow [or not], adaxially with 1 glands near base; stamens 6, free to +- attached to perianth; ovary superior, chambers 3, styles 3. Fruit: capsule, septicidal. Seed: many. Species In Genus: +- 8 species: central United States, western North America. Etymology: (Greek: poison garlic, for poisonous bulb) Toxicity: All taxa highly TOXIC (generally unpalatable) to livestock, humans from alkaloids (especially in bulbs). Note: As treated in TJM (1993), Zigadenus polyphyletic, so California members transferred to Toxicoscordion (Zomlefer & Judd 2002 Novon 12:299--308). Habit: Bulb 10--40 mm diam, ovoid; outer coat dark brown to black. Stem: 30--60 cm, glabrous. Leaf: 10--30 cm, 3--10 mm wide, scabrous-ciliate. Inflorescence: generally panicle, 10--35 cm, open; bracts 2--8 mm, green; pedicels in fruit generally spreading, 10--40 mm. Flower: on branches generally bisexual or staminate; perianth parts 5--8 mm, ovate to elliptic, +- obtuse, outer +- not clawed, inner clawed, gland distal margins evident; stamens +- 2/3 perianth; styles spreading or recurved. Fruit: 8--20 mm, oblong. Chromosomes: n=11. 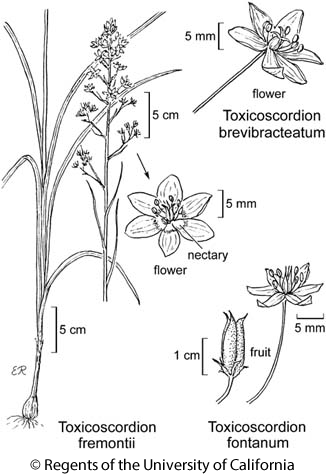 Citation for this treatment: Dale W. McNeal & Wendy B. Zomlefer 2012, Toxicoscordion brevibracteatum, in Jepson Flora Project (eds.) Jepson eFlora, http://ucjeps.berkeley.edu/eflora/eflora_display.php?tid=89160, accessed on April 23, 2019. Teh, WTR, DMoj. Markers link to CCH specimen records. Yellow markers indicate records that may provide evidence for eFlora range revision or may have georeferencing or identification issues. Purple markers indicate specimens collected from a garden, greenhouse, or other non-wild location.